Do Your Tenants have Renters Insurance? The importance of renters insurance is communicated to our residents from the beginning of our lease relationship. We find that many residents don’t think its important to have renters insurance until we communicate the need for it. When we sign the lease with them we review their responsibilities if they or a guest cause action that result in property damage or harm to others. In fact, most renters incorrectly assume that the landlord has the responsibility to make them wh ole financially if there is a fire or plumbing leak. This responsibility only exists if the landlord can be shown to be negligent. So how do we address this in our lease without requiring residents to carry renters insurance? First, we strongly recommend that our resident DO get renters insurance and make it very easy for them to do so. With our resident portal through our online software, they can get renters insurance with a few clicks of the mouse. Our lease also states that we waive the right for subrogation in return for the tenant waiving their subrogation rights referred to as a protective mutual waiver of subrogation. We find that being through at our lease signing with the residents has made a large impact on weather or not tenants obtain renters insurance or not. This is just one of the many ways that we provide an extra layer of protection to our clients and their investments. Charming north-end bungalow! Completely renovated. Maple cabinets, stainless appliances, pendant lights over breakfast bar, maple engineered hardwood in great room & dining/kitchen. Bath has loads of cabinets, new vinyl, tiled tub/shower, newer vanity & sink. Master w/big walk-in closet & new carpet, second bedroom & cool home office plus fresh paint throughout make this a great home. Extras include fully fenced yard w/patio, new sod & planting beds PLUS a big two car garage & additional off-street parking. 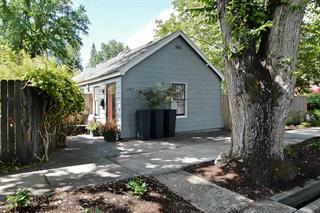 Are you looking for a Boise North-end property? The North-end is one of the most desired locations to live in Boise. Its important to have the right agent searching for your dream home so you no opportunities are missed! Contact us today so we can help your DREAMS COME TRUE!